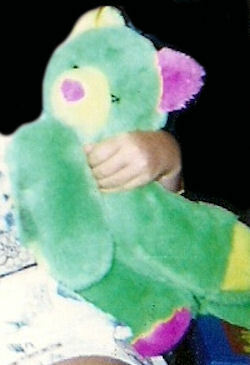 I’m looking for a very old stuffed animal, maybe from the 90’s. It looked like a Beagle dog in overalls and a checkered shirt. I’m looking for a floppy furry 90s neon green lying down cat? bear? with a long tail and pink, and yellow accents. It may be a Stuffins. Searching – 80’s? 90’s? MULTI-COLOR DINOSAUR CHILD’S PURSE? BACKPACK? 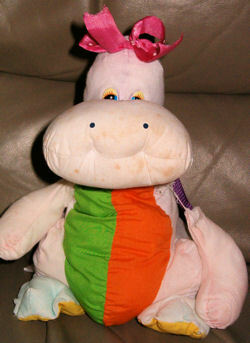 I’m looking for a multi-colored purple dinosaur/dragon with a white nose, blue eyes, red arms, green and orange belly, blue feet, and a yellow bottom. 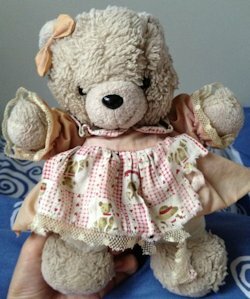 I’m looking for a 1996-97 Suntoys cream 12-15 inch bear in a pink dress with a calico print lace trimmed apron. The ribbon is on the dress, not the ear. 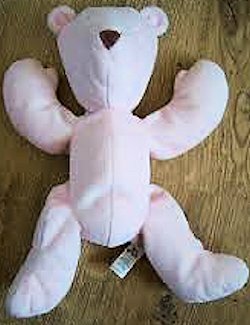 I’m looking for a plush Marks and Spencer pink bear. It was bought in 1995, and you could also get it in a different color.